1. Preheat the oven to 190°C (375°F) Gas mark 5. 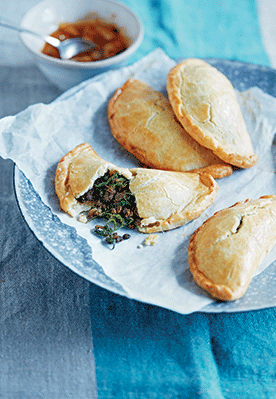 To make the pasty filling, heat the oil in a saucepan and sauté the onion and garlic until the onion is soft. Add the spices and salt, stir and cook for 2 minutes more. Stir in the lentils and remove from the heat. 2. In another saucepan, wilt the spinach with a teaspoon of water and then drain, pushing the spinach onto a fine-mesh sieve/strainer to remove the excess liquid. Chop the spinach and stir into the lentils until evenly distributed and set aside to cool. 3. Take the pastry from the fridge. Break off a 100g piece of pastry – weighing it out on the scales. Roll into a ball with your hands. Lay a piece of clingfilm onto the work surface. Place the pastry piece in the middle and lay a second piece of clingfilm over the top. Roll out the pastry to a thickness of 4–5 mm in a circle. Remove the top layer of clingfilm and place two tablespoons of the filling mixture into the middle of one side of the pastry disc. 4. Using the clingfilm to help you, pull one side of the disc over the filling so that it meets the other side, forming a crescent shape. Press down the edges to seal and trim away the excess. Crimp the edges lightly using a fork and then transfer to the lined baking sheet. 5. Repeat with the remaining pastry and filling, and once all the pasties are on the baking sheet, brush the tops with the beaten egg. Bake in the preheated oven for 15–20 minutes until golden. Remove and allow to cool for a few minutes before serving. 1. This is most easily done using a food processor. Put the dry ingredients and cubed vegetable shortening in and pulse to fine crumbs. 2. Pour in the egg, mix briefly and then, with the mixer still running, pour in the hot water slowly and mix until completely combined. The mixture will be smooth and almost paste-like. 3. Use a metal spoon to scrape the mixture onto a piece of clingfilm that has been lightly floured. Wrap the pastry in the clingfilm and shape into a disc. 4. Chill in the fridge, for at least 3 hours, until completely cold and firmer to the touch. To make the pastry by hand, put the dry ingredients into a large bowl and mix. Add the vegetable shortening and, with a handheld electric whisk set to a low speed, mix to fine crumbs. Pour in the egg and mix briefly, then, with the mixer still running, pour in the hot water slowly and mix until completely combined. The mixture will be smooth and almost paste-like and will stick to your blades quite a bit. Wrap and chill as above. This pastry is very wet when first made, and requires chilling before it can be used. Don’t worry that you seem to have made more of a paste than a pastry, just wrap it up and come back to it in a few hours and it will be perfect!